Hanako Maki | The Phoenix Junior outside hitter Quinn Spieker spikes the ball against Missouri State. 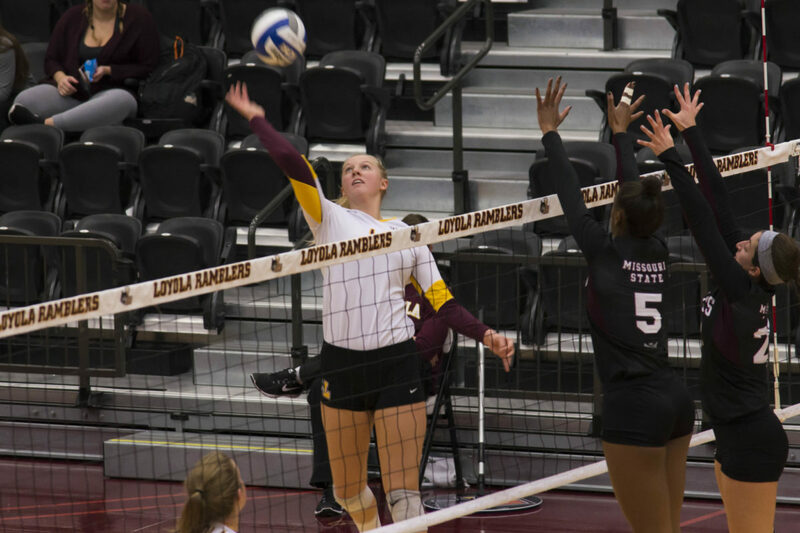 The Loyola women’s volleyball team (3-2) defeated Georgia State University 3-0 for its second sweep of the day Friday night. The match went back-and-forth from the beginning. After Georgia State tied the first set 20-20, Loyola came out on top 25-23. The second set was a similar story, as the two teams were tied 15-15 before the Ramblers went on a 10-2 run to take a 2-0 lead. In the third set, Loyola never led by more than four points until going on a 9-4 run to take the set 25-18 and complete the sweep. Junior outside hitter Quinn Spieker led Loyola with 12 kills while sophomore middle blocker Elle Van Grinsven had nine. In two games Friday, Spieker tallied 23 kills and attributed her teammates’ performances to her improvement. The Ramblers are set to square off against Marshall University Sept. 1 to conclude the 2018 Rambler Challenge.